Credit card – A friend or a foe? Salman Khan's 'Bharat' new poster was revealed today. As opposed to the poster unveiled on Monday which showed him as 60-year-old man, the latest poster sees the superstar in an all-new avatar. The poster is all about Bharat ki Jawaani. Salman Khan featured in the poster as a young man, similar to the look from his movie 'Maine Pyar Kiya'. Director Ali Abbas Zafar had previously revealed that they are trying to recreate the look, and the efforts have definitely not gone unnoticed. Not only people from the Indian platform, but audiences from the countries outside of India also seem to be fond of Salman's new look. Among them is none other than Hollywood's renowned model-singer-actress-fashion designer Paris Hilton. Soon after Salman Khan shared the poster on his Instagram handle, Hilton went on to leave quite a cool comment. She used an emoticon which had sunglasses on. Paris was either complimenting Salman Khan's look for being so hot, or she just wanted to feel cool. 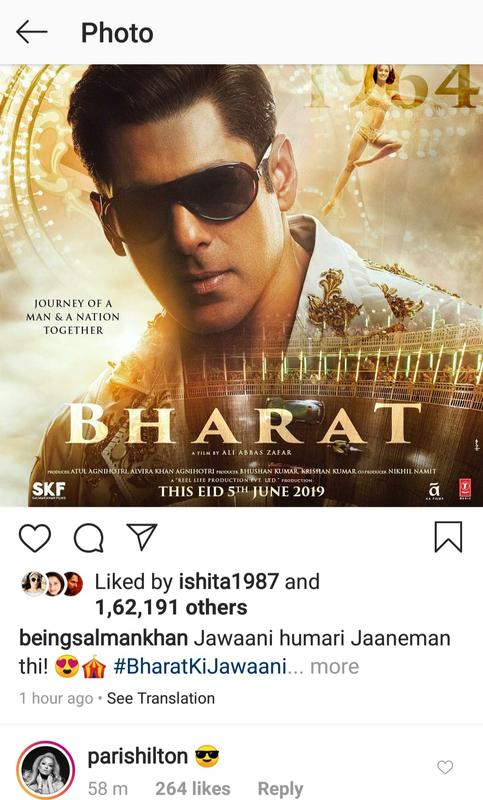 Either ways she is impressed with the work on Salman Khan's 'Bharat' poster. Co-incidentally the poster also featured Disha Patani who is an international sensation after working in the movie 'Kung Fu Yoga' with Jackie Chan. The model-turned-actress makes heads turn with her hot appearances everywhere, and same is the case outside India too. Directed by Ali Abbas Zafar and produced by Atul Agnihotri along with Salman Khan Films, 'Bharat' features Katrina Kaif, Sunil Grover, Tabu, Nora Fatehi, Jackie Shroff, Sonali Kulkarni and Aashif Sheikh in pivotal roles. The movie will also witness a cameo by Varun Dhawan. It is slated to release this Eid i.e. on June 5, 2019.